Finding file cabinet parts for sale can be difficult in typical hardware stores. Most hardware stores only carry a small selection of replacement parts and accessories and few carry filing cabinet parts in stock. If you call your file cabinet manufacturer's customer service or ordering department however many brands have spare parts including file cabinet rails, sliders, locks, and drawer dividers which can be ordered direct from the manufacturer. Not all manufacturers will make things so easily however, especially generic manufacturers. Additionally generic or antique file cabinets may not even have a manufacturer to contact. If you need to find replacement parts for your generic filing cabinet then many after market parts companies do offer generic items like file cabinets locks and keys, file cabinet drawer slides, or other basic file cabinet accessories. Having a branded cabinet however may make replacing malfunction parts easier. Finding Hon file cabinet parts for sale is actually fairly easy. Hon file cabinets makes some of the most common file cabinets found in offices. They are a trusted brand and have been around for a long time. Hon offers manufacturer direct parts like a Hon file cabinet lock kit or drawer slider among others and has warrantees on their main cabinets for trust up front. 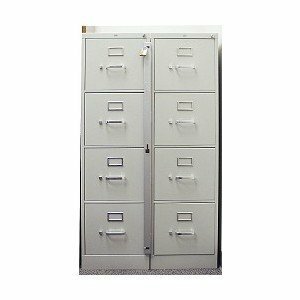 Even though Hon filing cabinets are covered by a warrantee some people may need replacement locks for their file cabinet simply to change the lock and key for issues revolving around security breaches. This is one of the advantages of buying a file cabinet from a trusted brand. Similar to Hon and their manufactured replacement parts, Steelcase is another major brand which manufactures quality filing cabinets. They too have warrantees on their products but they also have replacement parts and accessories available for the after market crowd. Because Steelcase has their hands in many product lines including equipment and furniture that secondary market for these products is high and there are many generic part manufacturers which produce discount parts for filing cabinets and other Steelcase furniture. These replacement parts and accessories are often cheaper on a whole than buying Steelcase brand pieces but they may not perfectly match up with what you need. Other filing cabinet manufacturers such as Meridian, Shaw Walker, and Haworth have similar policies and the after market for replacement pieces to their products is just as strong and robust. These discount generic part companies can usually be found online and most have guarantees for the parts they sell. Not all file cabinets are manufactured by companies currently in business or by branded manufactures. Many of these pieces of office furniture do not always meet standard dimensions or scale which makes shopping for replacement file cabinet parts for antique furniture can be tricky. Depending on your piece you may need to shop around for the best part and you may need to resort to trail and error. Buying parts that fit standard filing cabinets may work but they may need to be adjusted. If worse comes to worse you can always contact a local furniture repair company to assist in restoring your antique filing system. Hi, I have Shaw Wlaker Metal 5 draw lateral filing cabinet. I moved and took the draws out (Its heavy! ), and lost the metal tabs and screws that hold the drawers in. Any ideas where I can get them?